Many Public Utility Districts (PUDs) purchase power from the Bonneville Power Administration (BPA). BPA is the government agency that markets power produced by the Columbia River Basin hydropower system. Among the fourteen dams in this system are four on the lower Snake River that have cost the PUD ratepayers billions of dollars while producing a mere 15 cent benefit for every dollar spent. They are economic losers, producing little power compared to their rising operation and maintenance costs. The power they do produce comes at a time when there is little demand. Their power generation infrastructure is aging and needs to be replaced. These four dams have decimated Snake River salmon and steelhead populations. One third of BPA power rates now go towards efforts to bring back salmon stocks in the Pacific Northwest that have vanished due to dam construction. Decades of salmon mitigation efforts on the dams have not recovered any salmon or steelhead runs and there is no end to spending in sight. Your money continues to be wasted on ineffective salmon recovery efforts. 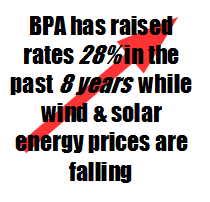 BPA has raised it’s rates 28% in the past 8 years while prices for wind & solar energy have fallen far below what BPA now charges. Do you want BPA to continue wasting your money each month, or do you want to speak up and be counted? If your power comes from a PUD that buys power from BPA, then it is your right to speak up and demand change from your PUD. Look below to see a list of those PUD’s. The most effective is to attend a commissioner or board meeting at your PUD to get your comments on the public record. See regular meeting schedules below, but always call ahead to make sure the meeting is still being held and to obtain the address. Your PUD will appreciate a call in advance to let them know you want to make comments and may ask you to come early and for any materials in advance. You can request to be added to the agenda and that may provide you with a little more than the typical 5 minutes. If unable to attend in person, please submit comments by e-mail. We have written up a sheet of Talking Points that you can speak to or read from. They explain why “mothballing” or placing these four dams into a non-operational status, can help BPA to lower power rates, recover from it’s dismal financial state, and start the recovery of salmon and steelhead. Make 3-5 copies of the Talking Points so that you may provide them to each commissioner. Or e-mail the talking points to them. It would also be helpful to personalize your comments by letting the PUD know that you are a rate-payer in their area and you expect them to be good stewards of your rate dollars as well as endangered salmon and resident killer whales. That doesn’t sound too difficult, is there anything else I can do? Proposed federal legislation called House Bill HR 3144 was introduced by Washington Representative Cathy McMorris-Rodgers to keep the lower Snake River dams in place regardless of what the current science says about salmon recovery. Some PUD’s have issued resolutions that endorse HR 3144. Given the facts, it is hard to fathom why they would support this bill. It’s very likely the information they considered came primarily from the strong pro-dam lobby. In PUD meetings we have attended to present the data from our talking points paper, commissioners have been surprised and intrigued to learn there is more to the story than the pro-dam perspective! That is why it is so important that ratepayers like you speak up. You may see below if your PUD supports the legislation. If they have not, thank them for rejecting it. If they have, please ask them to reconsider. If you have questions, you can contact us at info@damsense.org or on our Facebook page. And, if you are able to get to one of the PUD meetings, we’d love to hear how it went! Utility Phone Meeting Schedule Submit comments for Commissioners / Board Commissioner/Board position on HR 3144?